Whether looking to host an event on the lake shore or in the city, CityFlatsHotel has you covered. Create lasting memories by booking your wedding, meeting, or event at CityFlatsHotel Holland or Grand Rapids. Click for details about Grand Rapids and Holland gathering spaces. Or, fill out this RFP form to connect with us. Your most special day deserves a special venue. We know that no two events are the same, so CityFlatsHotel is about working together to turn your ideas into reality. 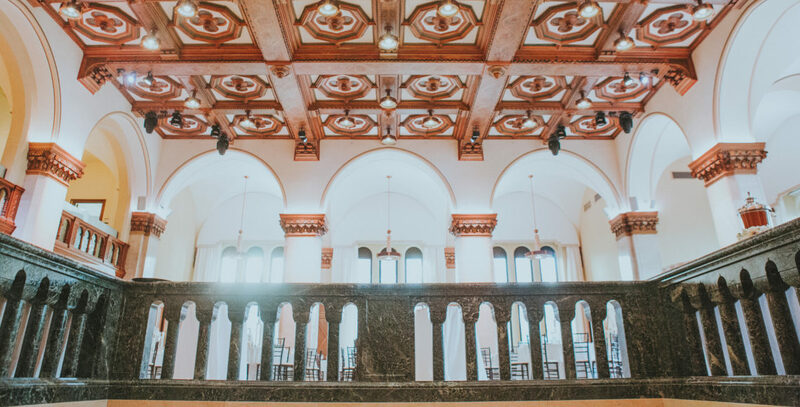 CityFlatsHotel Grand Rapids’ banquet spaces blends historic architecture with modern style. The Ballroom and Events @ CityFlatsHotel are the perfect place for wedding ceremonies and receptions. Multiple spaces and dining options offer a great fit for weddings, rehearsal dinners, or cocktail parties at CityFlatsHotel in downtown Holland. CityVū Events, atop CityFlatsHotel – Holland, will open in the Spring of 2016 as Holland’s premier rooftop events space. Impress with the best at CityFlatsHotel. Presentations, meetings, and celebrations are a breeze when you host your next corporate event with us. Add a touch of sophistication to your next meeting. You will find state-of-the-art equipment, nutritious meals, and comfortable seating in the Ballroom and conference rooms at CityFlatsHotel – Grand Rapids. The Conference Room, Board Room, and Theater offer three fresh options to host your event. Your clients will feel well taken care of with our on-site catering, unique guest rooms, and happy hour. CityVū Events, atop CityFlatsHotel – Holland, will open in the Spring of 2016 as Holland’s premier rooftop events space. Whether you need to entertain for business or pleasure, whether your occasion is small or large, you will find what suits your needs and more at CityFlatsHotel. CitySēn Lounge, the Ballroom, and the new Events @ CityFlatsHotel will have you searching for reunions, birthdays, and any other excuse to celebrate. Our main floor lounge with comfortable seating and amazing drinks, CityVū Events, atop CityFlatsHotel – Holland, will open in the Spring of 2016 as Holland’s premier rooftop events space, and private main floor event space all make for a reason to get-together. Our styling lounge can be reserved as a private area to relax and enjoy salon services on your special day with family and friends. The Parlour @ CityFlatsHotel is a full service salon that specializes in event hairstyling and professional makeup application, as well as manicures, shellac manicures, and facial waxing.